"Yes we did receive it and it is beautiful. 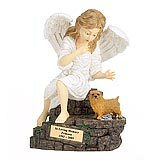 Last year we, unfortunely, lost our other beloved dog and we purchased the same urn only in the stone finish. It is so nice that you take the time to write out a personal note, that means a lot to us." 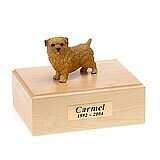 All available Norfolk Terrier dog urns and memorials will be displayed with the figurine on the Norfolk Terrier urn you select and in the appropriate size.